“Treasury tells us there are 285 000 kids living in poverty, the Ministry of Health tells us that 100 000 of them are going to school hungry every day… and the Prime Minister tells us he wants to change the flag! 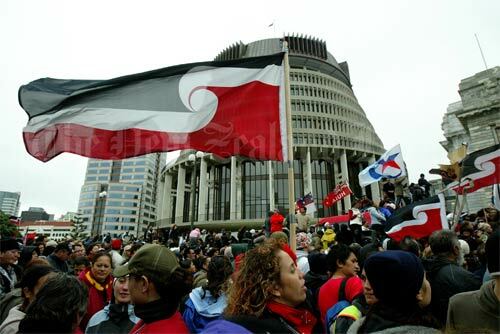 Eliminating child poverty, homes for all families and jobs for everyone – those are the real issues, not the flag.” That was Hone Harawira’s response to the announcement from John Key on 11 March that the country needs a “public discussion” on the flag. He’s quite right. Hungry kids can’t eat a flag. Key has posed the question in terms that could be taken from either side of politics: “the New Zealand flag symbolizes a colonial and post-colonial era whose time has passed,” he said in a speech at Victoria University. This echoes the language of much of the liberal left, for whom New Zealand’s new multicultural identity renders the old symbols of empire redundant. The flag certainly symbolizes a colonial history – the Union Jack, after all, is the flag of the Empire on which the sun never set and the blood never dried. Its position on New Zealand’s flag is a reminder that the New Zealand state was founded on conquest and theft – this flag traces its descent from the symbols flown as troops marched invading the Waikato in 1863-64 and at the siege of Waerenga-a-Hika. The current flag is just another blood-stained rag. But working people have no stake in this debate. It is their flag, not ours – calls to modernize or update symbols of nationalism are calls to make the appeal of “national identity” more effective. And this is the problem – “national identity” is a way of binding us – emotionally and spiritually, in the realm of affect as much as reason – to identify with the local ruling class and their needs. If we can be convinced that there is such a thing as the “national interest” then we accept the idea that local businesses and politicians deserve our loyalty over workers struggling overseas. But our interests as a class are with our brother and sister workers in Nuku’alofa and Nanjing, Apia and Adelaide, not with New Zealand bosses, not matter how multicultural their identity. All sorts of nonsense will be written and spoken about the current flag over the next six months. Reactionaries will insist that generations fought and died for the flag. Too many working-class men and women died last century in capitalism’s wars, to be sure, but it wasn’t freedom they defended: from New Zealand’s role suppressing national liberation in Vietnam to the war against Malay national liberation in the “Malayan Emergency” to taking part in deporting Koreans from Japan after World War Two and then assisting the United States in wrecking untold human suffering through the Korean war, still unresolved, the New Zealand flag has flown over many moments of imperialist slaughter and oppression. It’s a symbol of the shame and moral bankruptcy of our rulers and their system. There are flags that evoke pride in these islands. They are the flags of Aotearoa, flags symbolizing Maori resistance to the New Zealand state. The tino rangatiratanga flag, designed by Hiraina Marsden, Jan Smith and Linda Munn out of the ferment of protest activity in 1990. The flag of the United Tribes of New Zealand, an assertion of sovereignty pre-dating the Treaty. 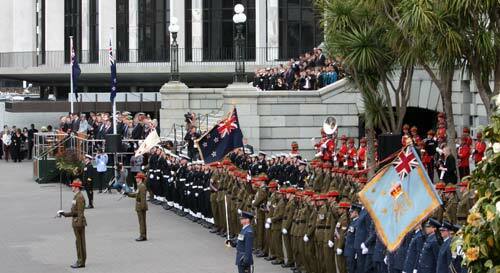 The flags of Te Mana Motuhake o Tuhoe and others, all asserting survival against the Union Jack of the official flag. Conservatives know what threat these flags represent, which is why they got so riled by the tino rangatiratanga flag flying from the Harbour Bridge. They should not be used to give a more attractive colouring to New Zealand nationalism. As socialists, we are internationalists. We do not identify as ‘New Zealanders’ or with the New Zealand state. The more we can win people to break with New Zealand identity, and to see themselves as workers connected internationally with all those in struggle, the better placed we will be in this country to fight. Debates about the flag, from this perspective, are a side-show and an irrelevance. We should not care what finery our rulers drape around themselves. Indifference is one legitimate response to this whole question. Hone Harawira has better things to worry about: child poverty, unemployment, cuts, poor housing. Contempt is another response. If it comes to a referendum, spoil your ballot – there’s nothing in this choice for workers. Our flag stays red.